This is a big day for the Missouri delegation to the Democratic National Convention as it awaits Senator Claire McCaskill’s headline speech at the convention this evening. State Democratic Party Chairman John Temporiti tells Missouri’s delegation the opportunity highlights McCaskill’s prominence in the Obama campaign. 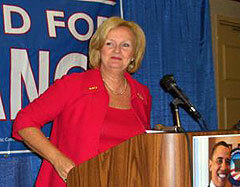 Temporiti says several national newspapers have picked up on the fact that McCaskill has become one of Barack Obama’s favorite surrogates during various news media interview shows. McCaskill came out early for Obama and tonight is rewarded with a speech during the prime-time evening portion of the convention just prior to a speech from Michelle Obama, Barack Obama’s wife. McCaskill says her speech will simply introduce Barack and Michelle Obama to the nation, letting the public know a bit more about the pair. She says she will not back away from criticizing Republican John McCain and contrasting the different visions Obama and McCain have for America. McCaskill has given a bit of a preview of her speech to the Missouri delegation, telling them that American families have lost ground the past seven and a half years under the Bush Administration and that McCain will simply keep the same policies. McCaskill is keeping a hectic schedule this week, speaking to several delegations, including Pennsylvania, Virginia, Colorado, North Carolina and California. She also will be addressing several special interest groups. Missouri has brought about 350 people to Denver for the convention, 88 delegates. The presidential primary between Barack Obama and Hillary Clinton was very close in Missouri, with Obama winning narrowly. The delegates were divided evenly between the two; 36-36. Most of Missouri’s so-called Super Delegates, though, have come out for Obama.